One of the most remarkable things about the Mormon religion is how its leaders can so badly misinterpret the basic meaning of certain words. Take “gift,” for example. When I think of a “gift,” I think of something given to another at no obligation, even though there still is a cost attached. The payment, however, is made by the giver, not by the receiver. When someone tells me he is picking up the tab for lunch, I receive the lunch gratefully. Yet while it is free to me, the meal cost someone money. The line is followed by a quotation of John 3:16, probably the most popular verse used by Evangelical Christians to succinctly explain the Christian gospel. A colorful 4-page cardboard insert titled “He is the Gift” was included in the mailing of this particular issue that features a photograph portraying Joseph, Mary, and the baby Jesus on the front along with a quote from the first part of John 3:16. Nine “pass-along (evangelism) cards” with perforations make up the third and fourth pages. The back of each card reads: “Discover The Gift. Embrace The Gift. #ShareTheGift.” A new LDS website “christmas.mormon.org” is also advertised. There is nobody who can do everything that the Mormon leadership says must be accomplished. After all, who can keep all the commandments? And is it even possible to “endure to the end”? This season is really all about the Christ child and the gift offered to us, not about what we can do to repay the Savior. As Matthew 1:21 puts it, “She will bear a son, and you shall call his name Jesus, for he will save his people from their sins.” Forgiveness is therefore possible! I cannot tell you how grateful I am that I have Discovered the Gift and indeed Embrace the Gift. And to my Latter-day Saint friends, family, neighbors, and many acquaintances, I hope to ShareTheGift. Great presents come in small packages, even in as small as a manger. This entry was posted in Grace, Jesus Christ, LDS Church, Salvation and tagged Christmas Gift, Church of Jesus Christ of Latter-day Saints, Grace, Jesus Christ, Mormon Church, Mormonism, ShareTheGift. Bookmark the permalink. 72 Responses to Is it really a gift? No one expects you to have all the answers, but there is a ‘formula’, magic or not. It is accepting Christ as your Lord and Savior, into your life. This is more than recognizing Him as Messiah, its recognizing Him as God Incarnate, come to Earth to sacrifice Himself for your sins. This is it. It really is that simple. God is merciful, and He cannot lie and will do what He says. That occurred through Jesus. He will also judge our heart and mind accurately, and that is based on having Christ in our lives, who acts as a sort of carpet cleaner for our sins: He makes them disappear in God’s eyes. The requirements you list will be fulfilled, though, when you are in Christ. I’ve, and others, have reiterated this truth over and over again. Correct me if I am wrong, but it seems there is something holding you back from accepting this simple formula to guarantee a place in the life to come. I don’t know if it is pride or something else, but there is something holding you back. If it is pride, all it takes is to set it aside and let Christ into your life. Pride is tough, though. I know. It still gets in my way. It wasn’t until I was able to let go of it to realize that life is so much better with Christ in my life and in control. It truly is. Your frustration leaves, stress leaves, and life is good. You see everything in a more positive light and there is a contentment in everything you do. Its a comfort to know that God has your back through all things. Struggle dissipates. But you have to let Christ in, which requires you set your own desires aside, and yes, following the rules are a result of your desire, not God’s. God wants you, not your efforts and desires to follow specific rules. He just wants you. You are speaking as a Mormon with your “to do list”. But remember, Mormonism isn’t Biblical Christianity. Mormonism is an invention of a man with a magic rock. So, as a Mormon, if you want to become a god, there is a lot of doing to receive this “gift” of attaining deity status. You have to earn your gift of becoming a god. So what you’ve got is a false religion with a false promise. You will devote a lot of time, money and effort in your pursuit of doing all you can do for your gift. It’s like those old Gold Bond Stamps they use to give out at gas stations when I was a kid. Collect enough stamps in your Gold Bond Stamp book and you could redeem it for some “gift”. You earned the gift. It’s a shame that you’re working so hard for a gift that won’t be there for you when you come to the end of your days here on earth. MJP , well said . Clyde , do you even bother reading what Eric wrote , especially the part about what Bill did with his family and gifts ? Nothing in my hand I bring , only to the cross I cling . That was a a little saying I heard many many years ago , it drove home the point that we can not earn eternal life — eternal life is a gift given those who fall on their face and totally surrender to God . Living in God’s home above is not gained by earning it through climbing the ladder of works that Mormon leaders call their gospel of Jesus . Read Eph 2:8-9 slowly over and over , see the glorious truth it reveals . ask Him to direct your path away from allegiance to Mormon prophets . It’s a big step . He will help. You seem to be overthinking what I have said. Hopefully you all have done it. Some may not notice some may. It might be big or small but you do it for the gift and that is that you change. Clyde , we love man , but you again are not coming in loud and clear . What’s it going to take for you to walk away from Mormonism and be free from a false prophet led organization . You seem like a nice person , and I have no doubt that you are a sincere person . However , there’s more to this issue than that . Because God’s Word does not return void you keep hanging around us and you’re liable to get saved . What a great day that will be . “You seem to be overthinking what I have said. Hopefully you all have done it. Some may not notice some may. It might be big or small but you do it for the gift and that is that you change. Would you mind rewording this because I don’t understand what you just said. Sounds like clyde is saying we work so that we can become better people. The gift is not Christ, the gift is us being better people and maybe the chance at exaltation. Clyde, if I misrepresent what you wrote, please clarify specifically what it is you mean. I think he is just saying we change out of appreciation for the gift. Some may have a big change and some may have a little change. I think he meant to say some may notice the change and some may not notice it. You may be right, catty, but he was not very clear with it. cattyjane got it right. We should show great appreciation for the gift. What Bill McKeever did that christmas was a very poor analogy but any analogy I have thought of may be better but still fall short of a good idea of what the gift is. So what the Bible says it what? From memory, “The wages of sin is death, but the……………(help me someone). I think we earn wages, but we don’t earn gifts. This translation says “free” as in “free gift”. We don’t earn “free”. We are given something “free” based on the Giver’s desire to bless us. How is this “free gift” obtained then? Do we have to say the sinner’s prayer? Not really though we may. The Bible says that we receive this free gift by faith. Saving faith is not acknowledging that there was a historic figure that lived a long time ago by the name of Jesus. Saving faith is not sending up a prayer to “God” when we are temporarily in need. Saving faith is trusting in Christ and Christ alone for our salvation. We don’t deserve this gift. We can’t earn this gift. We are granted the gift of eternal life on the basis of our faith. Confessing Jesus as Lord and Savior causes us to be born again by the Spirit of God and having repented of our sins, turn to living a life consistent with our confession of faith. OK, clyde, what must we do to change based upon acceptance of the gift? What, by the way, is the gift (before we go too far down the road of discussing acceptance of it)? And we must remember that clyde is talking about the LDS Mormon sect system of salvation. I doubt if even the leadership would have an answer for your question because LDS salvation i.e. becoming a god is not a gift. It is earned. We are having what is known as “cross-cultural-communication” in a religious sense. The LDS don’t go to the Word of God to get their guidance. They rely on their “prophets” to reveal information to them. As we know, these guys are highly unreliable. The “gift” of becoming a god is earned and awarded by the Mormon god after the LDS sect member has done all he can do; (performed) at a high level within the LDS system. So clyde has absolutely no idea what Romans 6:23 is saying. Frankly, the average Mormon wouldn’t care. They are system bound believers in the LDS program. There is no gift. There is only reward that is earned. As Christians we know that we are separated from God due to our sin. We know there is no way we can close the gap between our sin and the holiness God demands of us. God made provision for us by providing a perfect sin offering. Only He could be this offering because only He is perfect. The LDS system isn’t the Gospel message of the NT. It’s a far-out religion that has no foundation in the Word of God. In-order-to be within the LDS system, a Mormon must reject the message of the NT. falcon , your comments to MJP were spot on ! ……………………and so here’s something to meditate on. To some this may just be confusing and frustrating, but to me it’s stimulating. These Church Fathers thought thoughts that I couldn’t even begin to think. It can be a “throw up the hands” in surrender sort of moment; not even wanting to think about it. …………………and my point is that since Mormonism is hailed by the LDS folks as being the “restoration” of authentic, first century Christianity, don’t you think we might be able to find some evidence of it in the early Church? I provided some quotes above concerning the thoughts of one of the Church Fathers regarding the nature of God. Now agree with it or not, are there any writings by the Church Fathers or the heretics regarding Mormonism? We have one heretic, Arius, who claimed that Jesus was created by the Father but even he would have disowned Joseph Smith. My point? The topic here is God’s Gift. While we would say, as Paul did in Romans 6:23, that the “free gift” of God is eternal life through Christ Jesus Our Lord, we would also say that God’s Gift was Jesus and the Holy Spirit. Jesus was a Gift from the Father because of what He did for us on the cross. The Holy Spirit was definitely a Gift since on the Day of Pentecost He was given to the Church. There is no free gift in Mormonism. There is a program by which Mormons believe they can earn deification if they do enough temple rituals, tithe and live the Word of Wisdom. To Christians, we believe that Jesus is the means by which we obtain eternal life. To a Mormon, it’s the LDS system that made their god a god and all the gods in the universe, to numerous to count gods, and which will eventually make them gods if they do enough to merit it. There is no record of such thinking any where in the history of the early Church. Depending on false prophets to propose and explain Mormon conspiracy theories is a very bad choice. What did Joseph Smith receive in that little grove of trees where he said that God the Father and Jesus appeared to him? Did he receive the keys to the new dispensation? Were these keys a gift? Well the truth is sometimes hard for the LDS folks to deal with, especially if they are true believers. If we rewind this thing we find out that Joseph Smith told something like eight versions of his “first vision” story. The LDS try to cover this by saying he just added details. Well there is a difference, in my mind, between adding a few details and telling a totally different story. He originally said that he went out into the woods to receive assurance of the forgiveness of his sins. BTW, it wasn’t all that of an unusual thing in those days for people to do this; go to the woods and pray. Christian Evangelist Charles Finney did the same thing. And guess what? That day or shortly there after, Jesus appeared to him, he reported. This key to the dispensation and the restoration of the true gospel hasn’t turned out to be a free gift. The Bible tells us that is what salvation through Jesus Christ is; a free gift for all of those who place their faith in the Lord Jesus Christ. What Smith got eventually was a bunch of rituals he lifted from the Free Masons and a notion that men could become gods; that is if they earned it. I believe this is what the apostle Paul was talking about when he railed against false gospels to the Galatians and exhorted Timothy to up hold the standard of sound doctrine. Joseph Smith perpetrated a hoax and unfortunately a lot of people believed him then as well as now. 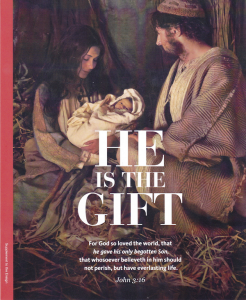 I find interesting how this Mormon church presentation of Jesus as a gift , and then combining that truth with a pitch about receiving eternal life as God’s greatest gift , and using the Christmas season to mention that . The idea behind giving gifts at Christmas time and the Mormon doctrine of mankind receiving the “gift” of eternal life from God are not even close . It’s rather sneaky for the Mormon church to use Christmas time like that . Most people will not discern the cleverly crafted way this is done . When I receive a gift at Christmas it is because someone in the family loves me — there’s no earning it by doing a list of things beforehand which they’ve demanded etc . But in Mormonism the picture is that of a store owner (God) placing a beautiful gift ( eternal life ) in a store front window , but to receive it personally shoppers must purchase it ( by working ) , thus earning it . In Mormonism eternal life ( what Mormons call exaltation ) is by earning through the rules, laws, regulations that is their ” restored gospel ” . Receiving the gift of eternal life is by earning it , climbing up to God’s home in heaven by the ladder of works Mormon leaders call their ” restored gospel ” . That may be a “gift” to Mormons but that is not the gift of eternal life the New Testament reveals –Rom 6:23 , the true gift of eternal life is received by admitting that our sins have separated us from God , and then asking for pardon by coming to Jesus as God’s way to receive complete forgiveness and the reception of eternal life . It takes place when the will is surrendered and the tongue confesses —Rom 10:9-13 , not by a lifelong of doing a list of works in order to hopefully qualify for it . The Mormon church wants to use Christmas time to talk about gifts knowing that the general public is thinking about gift giving , but that is a clever way to catch people’s attention and sneak in their false view about how people receive the greatest gift — eternal life . Why is it that the Mormon church is so proficient in the use of half truths in public venues ? The Mormon people who want to know the full truth about the babe born in Bethlehem who He is , and what He did to reconcile sinners to God , can exchange their Mormon publications for the New Testament . In doing so they will see how they can receive complete forgiveness of sin and the gift of eternal life . The other part of this is the sovereignty of God. If God wants to give someone a gift, he’ll do it. As God, it is His prerogative. The problem with the Mormons who hope to turn themselves into gods is that they have the sense that their works will get it done. They are under the impression that the Mormon god is demanding that they do “the work” necessary to become gods. But then I guess that would make the Mormon god sovereign also, right? No, not really. In this “system”, the “system” is soverign it’s not the Mormon gods. These gods, who used to be men, all went through the same soverign system. We need to continually ask, “Where do Mormons get the notion that they will become gods?”. It isn’t from the Bible. It’s not any where in the traditions and history of the Christian faith. To rely on ideas that emerged from a guy who sought to develop his own religion as a self-appointed prophet is a very bad choice. It should be mentioned that there are a couple of Mormon sects that wouldn’t go along with Smith’s wandering ideas. Falcon, as to the cross cultural communication: that is exactly what I am trying to bring out. They use so many of the same words that it is important to call them out and ask what they mean.